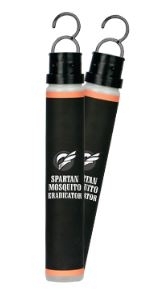 The Spartan Mosquito Eradicator is the most effective, longest lasting, continuous mosquito control system. Spartan doesn’t use sprays, fogs, coils, mosquito nets, citronella, electronic equipment, or zappers. The Spartan Mosquito Eradicator also doesn’t require batteries or electricity, just water! Easy to install — Hang along the property perimeter. Do not require power — Just add water and shake. Provide continuous, long range protection. Have no hazardous or unpleasant mists, airborne particulates, or spray-on chemicals. Are extremely effective — Significantly decreases population within 15 days. Provides up to 95% mosquito control for up to 90 days. Eradicate females and males before they can breed. Involve little maintenance at almost no cost — Just add water, shake, and replace at least every 90 days.